Arguably the closest RPG for the PC to ever rival console classic Legend of Zelda in gameplay and sheer addictiveness, Blood Omen: Legacy of Kain from Stormfront Studios/Crystal Dynamics is a highly underrated game that sold moderately well on the 3DO system, but poorly on the PC (for which it was published by Activision). Which is a shame, because Legacy of Kain is in all respects a true classic, and one that is much better than its overhyped sequel Soul Reaver. 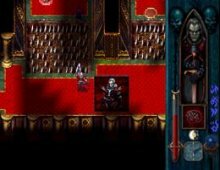 In this gothic RPG, you play Kain, an adventurer who has unwittingly become a vampire after being ambushed and subsequently murdered by brigands. You wake up in the underworld - where you are made an offer you can't refuse by a necromancer, who gives you the chance to return to life and seek vengeance upon your murderers. The gameplay, like in Zelda, strikes a perfect balance between action, physical puzzle-solving (e.g. find a way to get from point A to B), and a good ol' fantasy world full of items to collect and spells to cast. The fact that you're a vampire has real bearing on the game, and makes gameplay very entertaining (albeit gory) and unique. For instance, you are much stronger at night than in broad daylight, and similar to BloodNet, you have a "blood satiation" meter which you must keep filled at all times by drinking blood off victims (instead of hacking them to pieces with your sword). You are initially armed with only a sword, but as you proceed through the story, you will pick up various magic items and spells which aid you in your quest. Which, as it turns out, isn't just about taking a bite out of your murderers - you have to save Nosgoth from destruction by killing the Guardians of the Eight Pillars of Balance. You will even acquire the ability to turn into a bat at some point in the game -- a very handy way of getting across vast distances. There's not a huge amount of character interaction in the game, but this is not a big downside considering that the game's focus is on action and physical puzzles. One cool feature is that you can disguise yourself as a mortal and try to speak to the NPCs, but usually they just give some completely useless piece of information. Your quest progresses linearly - you can't kill the Guardians in any order - you have to follow a specific path. Still, you do have enough freedom, and there are many subplots (which mostly hinge on finding powerful items) to pursue. What is a shame is that you can't save your game whenever you want -- instead, you have to wait until you come across "save posts". Despite this console system-style flaw, Legacy of Kain excels in practically every other department, and its wonderful atmosphere and near-flawless gameplay will keep you hooked into the wee hours of the morning. A must-have for every RPG or action fan, and a true classic.